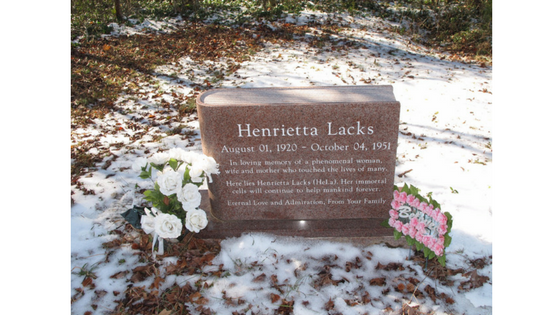 Anyone interested in Henrietta Lacks and the grave marker finally placed on her long unmarked grave this weekend should click here immediately for a beautiful post by scientist David Kroll, who attended the unveiling ceremony. It’s filled with beautiful photos of the day, and a tribute to all Henrietta’s cells did for science. His photo below shows Henrietta’s new headstone in much sharper detail than the one I posted yesterday with the text of the inscription. Visit his post for many more photos of the ceremony, the graveyard, and Henrietta’s family. Thanks so much for providing this story and the additional information about the dedication of this headstone. Your book was one of most exciting reads I’ve had this summer. I’m so glad that Henrietta and her family have finally gotten the peace that they were seeking and that Henrietta has finally been given the recognition she so deserves . . . . Thanks for this. I love that it’s shaped like a book. Speaking of which: Your book knocked my socks off. Thanks for that too. Hi. I am in a bookclub and we are reading your book for the month of July. I loved the book and the history in the book. I can’t wait to discuss the book with my fellow readers. If I remember correctly from your book, it was unclear exactly which grave was Henrietta’s in the family plot. So has her grave been identified or is the marker placed in the general vicinity of her grave? Either way, this is a really a wonderful thing to have happened. Wonderful work, Rebecca. You should be very, very proud.